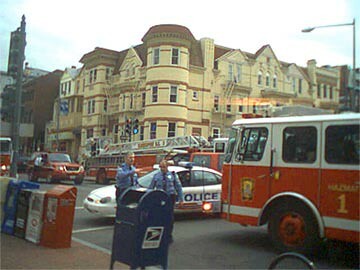 A bit of hubbub at 21st and P St NW yesterday, with hordes of firetrucks, hazmat teams, policemen, and other emergency response personnel laying down flares and blocking off the intersection. Before I could ask anyone what was going on, however, they started clearing out, and within five minutes the firetrucks were gone and the streets were open again. False alarm, I guess. Oh, that is just want they _want_ you to think!